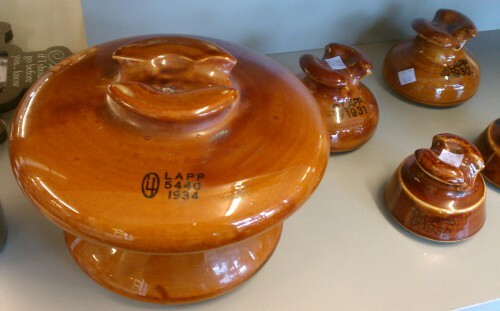 We spotted these fantastic vintage ceramic power-line insulators – including HUGE ones. Note these vintage insulators are not the usual glass telephone varieties, the are porcelain or pottery insulators by LAPP, with a rich glaze of what I’d call a “pumpkin brown”. Looks like these are dated from 1930-1934? We didn’t buy them. But if you want us to get them for you and ship them to you, that can be arranged. 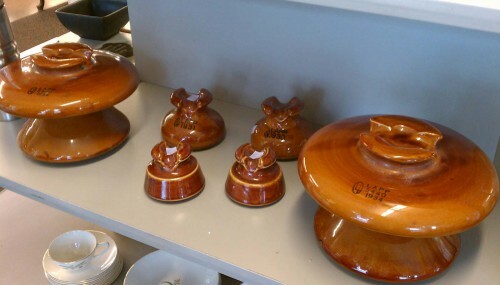 The traditional sized ones are selling for $10; the large ones are selling for $30. We’ll charge a $10 finders fee no matter how many you want — plus exact shipping to your location. Act quickly, as I don’t know how long they will be around!